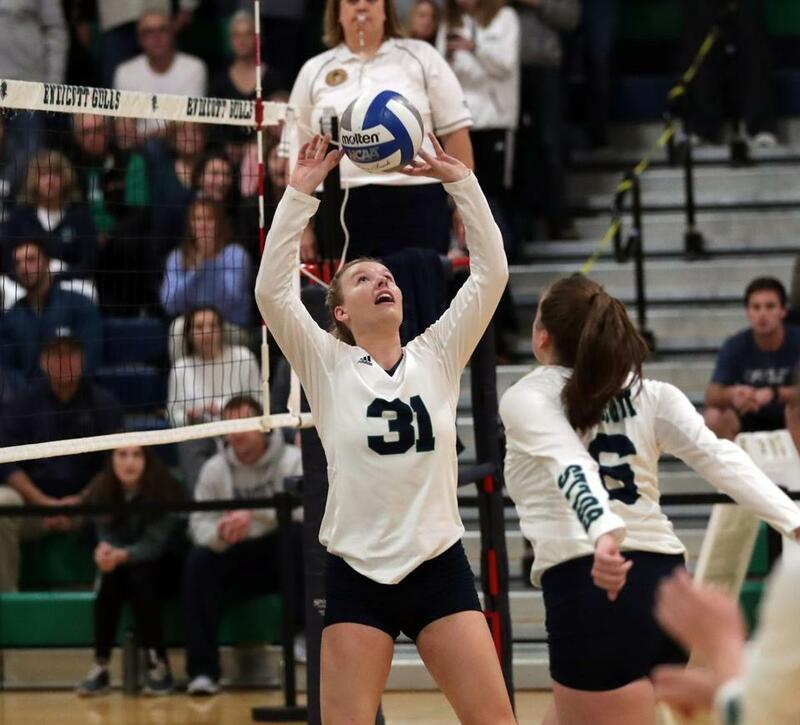 Zoey Gifford is the next in line, yet another player from the Endicott women’s volleyball program to net Player of the Year honors in the Commonwealth Coast Conference. First, Tori McIntyre, then back-to-back honors for Lynnfield’s Emma Mancini, and now, Gifford, a 5-foot-11-inch junior setter from Natick. In an 18-11 season for the Gulls, Gifford set the program record for assists per set in a single season (10.64), besting Meghan Hall’s mark set in 2008. She finished the season with 1,107 assists, 282 digs, and 30 blocks, all career bests. She was an honorable mention pick on the American Volleyball Coaches Association Division 3 All-American list. “Zoey is a terrific player,” said coach Tim Byram. “She’s a really hard worker. She has very good volleyball IQ, leadership, and is able to interact with her teammates well. Her competitive drive certainly received a boost at home. Her older sister, Lexi, played softball at the University of Connecticut until 2016 and owns the program record for defensive assists in a career. As a nursing student, Gifford spent time in the spring of 2016 volunteering in the rehabilitation department at Leonard Morse Hospital in Natick. She made the dean’s list at Endicott in the 2016-17 school year. Q. You’re the fourth straight Endicott player to be Player of the Year. What does coach Byram teach that connects with you all? A: I think it’s the culture of the team. In the preseason, coach always gives us all of our standards and reminds us that we have to be the ones to set the tone for incoming freshmen. It’s their first year, so whatever we make of it is what they’re going to think our culture is. We make sure as soon as preseason starts, everyone knows what we’re about. Q. You were awarded Most Improved Player your sophomore year [at Natick High]. What clicked from the previous year? A. I started playing competitive volleyball my freshman year. I was coming from doing a couple summer camps and clinics to actually playing every day. It started out very overwhelming. My sophomore year I moved up to varsity, I ended up splitting time with the other setter, and I had all these upperclassmen helping me. That’s when I found my confidence. I was really able to accept my role and understand what I had to do. Q. What’s the hardest class you take at Endicott? A. Care of the adult. You take a lot of hard classes in nursing, so care of the adult is a culmination of health assessment, pathophysiology, and pharmacology. It kind of brings everything together. Q. Have you learned anything about how to perform at a collegiate level from your sister Lexi? A. Yeah, I’ve always grown up watching her, and she’s been one of the best players on every single team she’s ever been on. It was very empowering to see her excel so much. Even at home, we’re both so competitive, we’d get in fights about everything. She is four years older than I am, so she was always bigger and stronger, but I always tried to win, anyway. It was always good to have her constantly pushing me. Q. What’s the most important advice you’ve received regarding volleyball that you can use in life? A. I would say to trust yourself. That’s always been something I’ve battled with. When I find my confidence is when I find my most success. Just knowing you’re not going to be 100 percent accurate any time you do anything. You have to trust that if you can’t do it, your teammates can help you. In life, you aren’t going to be perfect, but you can find success by leaning on others.